An employee who gets paid in head scratches and tennis balls? Meet Thunder, UMPD’s highly trained K9 officer. Like most University of Miami employees, Thunder rises early and readies himself for a busy day on the Coral Gables campus where he works from 6 a.m. to 2 p.m. Some days the morning shifts can be challenging—there never seems to be enough time for tail wagging or licking, he often needs help getting into his uniform, and coffee has never been his cup of tea. However, there’s no such thing as a “bad day,” and with one eager leap he’s in the squad car and ready to get to work. In fact, he’s trained for five years—his entire life—alongside experts from around the world to become one of the best in his field. 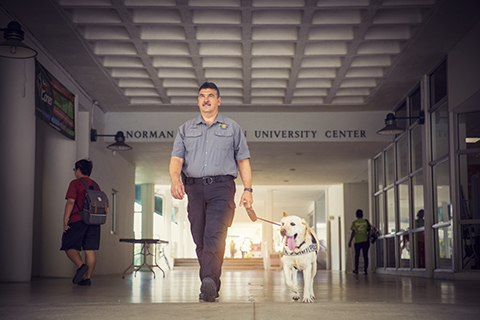 On a typical day at the U, Thunder spends most of his time in the center of campus: making rounds to various buildings; greeting as many students, faculty, and staff as possible; and ultimately working side-by-side with University of Miami Police (UMPD) Officer Jesus Gutierrez. 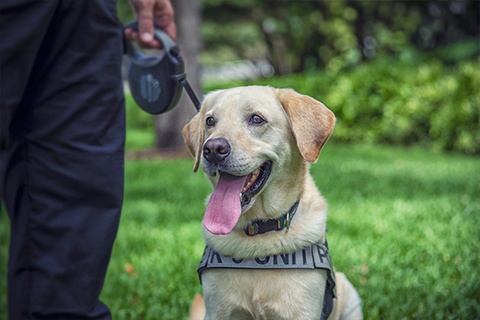 As the first Explosives Ordnance Detection (EOD) K9 police dog to join UMPD’s force, Thunder, the yellow labrador, is the University’s youngest and only four-legged employee, and he takes his job very seriously. Under the care and direction of Officer Gutierrez, Thunder is one of many EOD K9 police dogs working in higher education. 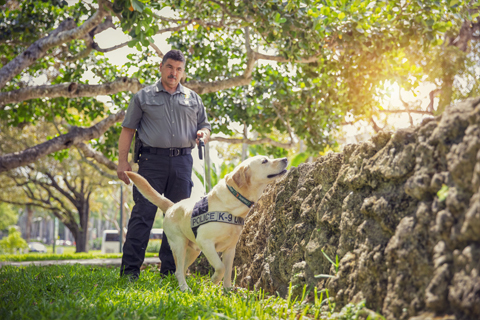 He’s trained to detect explosives in any environment or situation, and his sense of smell is so acute that he can identify chemical particles that are used in explosive devices and weapons. 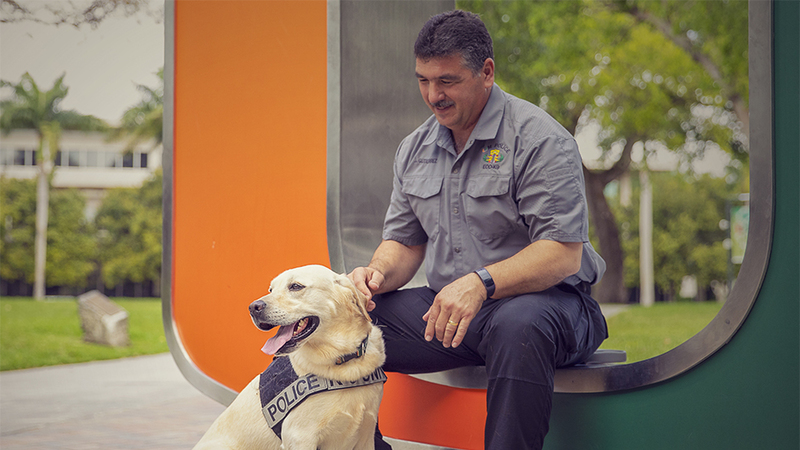 Like other police dogs, Thunder serves as an asset to his human counterparts, using his nose to sniff out a dangerous situation before it can even occur. 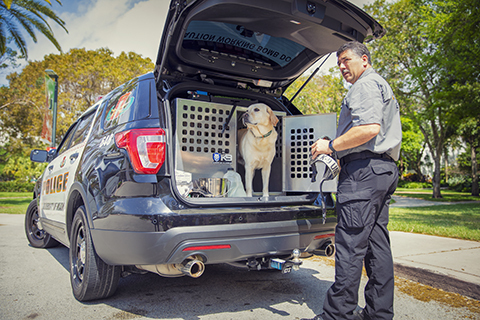 As part of his K9 career, Thunder is required to undergo ongoing rigorous training and testing at the nation’s top facilities. As his owner and trainer, UMPD’s Gutierrez is also a highly specialized police officer with over three decades of experience. 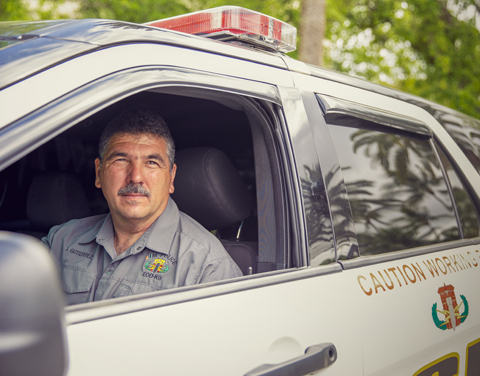 Before retiring in 2016 from the City of Miami Police Department, he spent years training nationally as a bomb technician, working as one of the most well-trained officers in the country. Today, in addition to his role at UM, Gutierrez continues to serve as a member of the Federal Bureau of Investigation’s Stabilization Team—the most elite group of nuclear and radiological warfare explosive technicians and experts. When Gutierrez and Thunder aren’t refining their skills, you are likely to find them working together on the Coral Gables campus. In addition to their busy training schedules, the duo makes time to greet students—with a pawshake or slobbers—and they try to squeeze in ample time for belly scratches and nose boops, the most simple pleasures of dog life. While making their rounds, Gutierrez uses this time to connect with students, faculty, and staff, and to educate the UM community on the importance of Thunder’s role on campus. After a long day’s work, Thunder makes his way into the UMPD squad car and enjoys the air conditioning before returning home to the Gutierrez family. Once the badge comes off, he’ll have plenty of time to chomp on his favorite toys, chase a few squirrels, and of course, snuggle up next to his “pawrents” at home. After all, a full-time career is a lot of work for a five-year-old.